Jonatan Christie ended Indonesia's long wait for the Asian Games men's badminton gold medal on Tuesday as Bahrain won the first major title in athletics' new gambit, the 4x400 metres mixed relay. Christie sent the home crowd into raptures as he upset Taiwan's sixth-ranked Chou Tien-chen 21-18, 20-22, 21-15 to become Indonesia's first men's singles champion since 2006, before ripping off his shirt in celebration. The 20-year-old's surprise win capped a memorable run for Indonesia's men after Anthony Sinisuka Ginting knocked out world champion Kento Momota and Olympic gold-medallist Chen Long en route to bronze. Kevin Sanjaya Sukamuljo and Marcus Fernaldi Gideon, nicknamed the "Minions" owing to their stature, rounded off the party as they won an all-Indonesian final against Fajar Alfian and Muhammad Rian Ardianto 13-21, 21-18, 24-22. In a celebratory atmosphere at the badminton stadium, Sukamuljo and Gideon collapsed to the floor as their opponents' final shot went wide to settle a tense final game. Once-dominant China failed to win a singles badminton medal for the first time in 38 years, but otherwise it was another productive day for the Olympic heavyweights. China passed 200 medals early in the day and they finished with four golds in track and field, including Xie Wenjun's come-from-behind victory in the 110m hurdles. Xie, 28, capitalised on a late stumble by Taiwan's Chen Kuei-ru to claim China's ninth straight win in the event, before revealing he had received "special instructions" from Chinese hurdling great Liu Xiang. "Before the match, before I went to Europe, he gave me special instructions. I really thank him," said Xie, who also won the sprint hurdles in 2014. But it was Bahrain who took the honours in the Games' inaugural mixed relay, a new venture which will feature at the Tokyo 2020 Olympics. India were second, nearly four seconds behind. "It's the first time I've raced with girls!" said Bahrain's Abbas Abbas. As the dust settled on day 10, China were on 97 gold medals, more than double Japan's 43, with South Korea on 32 and Indonesia on 24. Earlier, Saudi Arabia ended their wait for their first gold medal of the Games when they won equestrian's team jumping event. Hong Kong's former Olympic bronze medallist Sarah Lee Wai-sze successfully defended her keirin title, becoming the first woman to win four track cycling golds at the Asian Games. China's supreme table tennis players won their 10th women's and men's team golds as they kicked off their latest bid for a clean sweep of the sport. Chinese 14-year-olds Zhang Jiaqi and Zhang Minjie -- who was celebrating her birthday -- became the 2018 Games' youngest winners, in the women's synchronised 10m platform. Cao Yuan and Xie Siyi also won the men's synchronised 10m platform as China extended its perfect record of winning both events five times out of five at the Asian Games. After complaints over the judging in Monday's pencak silat, in which Indonesian athletes won all six golds, Uzbekistan cleaned up in kurash, another martial art making its debut. 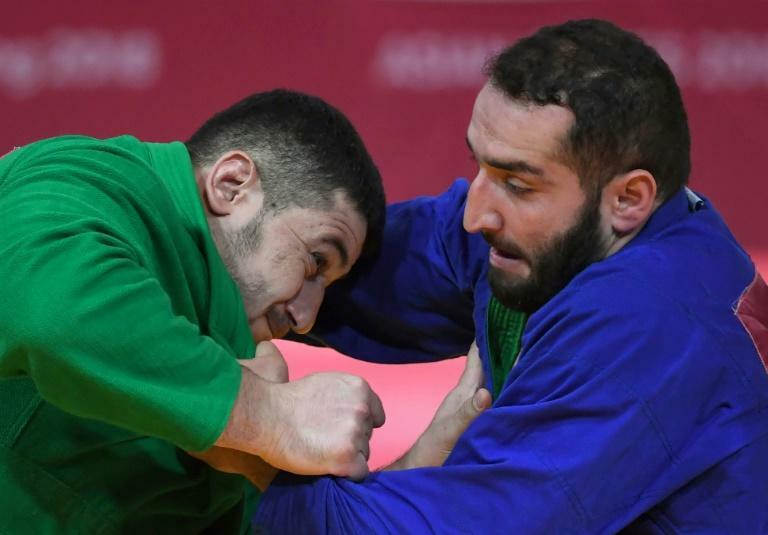 Maruf Gaybulloev had the honour of winning the first ever Asian Games gold in the Central Asian wrestling sport, quickly followed by compatriots Mukhsin Khisomiddinov and Gulnor Sulaymanova. Meanwhile Malaysia, who won 145 golds at last year's Southeast Asian Games on home soil, swelled their haul to four in Jakarta with a victory in sepak takraw, which is similar to volleyball but played with the feet.